Rating 4.5 stars. This story enchanted me, like all good fairy-tales should. It’s a modern, grown-up take on traditional fairy-tales from Eastern and Central Europe. Modern ideas of self-determination and feminism are woven in with timeless values on friendship, family, and affinity for the places we call home. The language is rich and the prose is beautiful, though can be heavy-handed in places. Throughout Uprooted I really enjoyed Agnieszka’s agency and self determination, and I think those qualities make her a really interesting role model that I would be keen for older teens to be exposed to. One of my favourite quotes captures that sentiment perfectly. Her decision to stand up for what felt right for her, and to refuse to be labelled by others gives momentum to her growing self belief, and felt like a powerful moment of leadership, without any show of aggression or guidance from others. It was the kind of moment that I wish I saw more often in fantasy novels. I really enjoyed the interplay between the Dragon’s generally ‘good’ moral code and his abrasive personality. I thought that Novik presented him well, and didn’t fall into the trap of having him instantly turn out to be the hero of the story who was simply misunderstood and needed a woman’s touch to revive him (a Beauty & the Beast moment for example). He is never the hero of the story as whole, or within it, the hero of Agnieszka’s story. Though he certainly supports her along the way, in the end it is her empathy that gives her the ability to rise to challenges, not her connection to the Dragon. It was refreshing to have a character in a fantasy novel who was unapologetically obnoxious at times, but who the protagonist didn’t feelt he need to try and ‘fix’. It’s hard to find a YA or even Adult fantasy novel that doesn’t have some element of a love story, after-all as humans we crave connection is various different ways. But to me Uprooted was more focused on friendship rather than romantic love. Agnieszka’s friendship with Kasia is challenged again and again throughout the novel, and yet it only grows deeper despite the trails they face both apart and together. This was one of the great treasures of this book, a beautiful female friendship that felt so real. 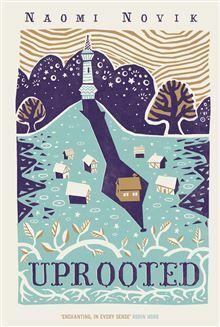 If you are looking for a fair tale read filled with complex relationships and beautiful language then Uprooted is the story for you. It’s rare to find a stand-alone fantasy novel these days, and this is a rare gem that tells the kind of story you’ll be begging your friends to read too so you can discuss it. Suitable for ages 16 and up because of some adult themes and scenes.